The aim of the Master degree is to shape new experts on climate change, providing them with the most recent knowledge in the scientific field and the main tools of political analysis. The course is highly multidisciplinary, as it investigates social, economic and scientific aspects of climate change. It is therefore designed for those who seek innovative solutions from a technological, behavioural and social point of view. The Master in Climate Change Science and Management was born from the strict collaboration between Ca’ Foscari University of Venice and the CMCC Foundation – Euro-Mediterranean Center on Climate Change (CMCC). It addresses both Italian and international students, who are willing to understand the complexity of climate change in its global dimension, considering its interconnections with sustainable development. 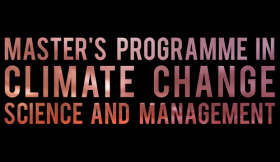 The Programme offers high-level courses, thanks to the connection with the PhD in Science and management of Climate Change. Applications are open until the 15th July 2018. Visit the Master’s Degree webpage.